Great performances at the Age Groups with medals for Beth and Stella! Last weekend and this weekend, many of our U13s, U15s, U17s, U20s and Seniors took part in the National Championships and there were lots of great performances across the two weekends! Last Saturday, Nikkala, Jacob, Owen, Lucy and Lewis all took part in the U17 and senior championships. In the U17s, Nikkala reached the semi-final of the 100m where she ran a great time of 13.04. And Jacob came an impressive 4th in the 1500 Steeplechase with a PB of 4:56.36. Well done to both! Meanwhile, Owen and Lucy stepped up an age group to take part in the Senior championships. Owen came 6th in his heat of the 100m with a PB of 11,61, and Lucy came 9th overall in the 800 with a great time of 2:18.69. Then finally, Lewis came 2nd in the 400m heat, taking him straight to Sunday’s final. Well done to them all! On the Sunday the conditions were horrendous, with cold wind and rain all day but Jamie, Hannah and Paul all bravely took part in their U17 events. Jamie jumped 1.72 in the high jump finishing 7th overall, Paul came 7th in the shot put with 8.45m, and 11th in the discus with a PB of 25.47, and Hannah came 6th in the 80H with a time of 13.25, and also 6th in the Long Jump with 4.84m. And Owen, Lucy and Lewis all took part in the Senior Champs; Owen ran well in the 200m to finish 6th in his heat, Alicia ran a strong 3000SC to finish 5th overall, and Lewis finished 4th in the final of the 400m. Well done to them all! This weekend, the success continued up in Aberdeen! Firstly, we had Grace taking part in her first u13 National Championships. She ran really strongly, making it to the final with a time of 14.09, a great achievement! She also came 5th in her 200m heat with a time of 31.87. Owen and Beth were also competing on the Saturday, with Owen coming 7th in his heat with a new PB of 11.81! 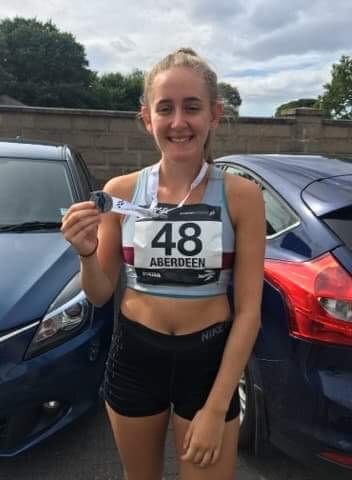 Beth came 6th in the 100m heats with a time of 13.39, but then followed this with a fantastic SILVER medal in the 100m hurdles in a time of 15.98. Well done! On Sunday, Stella kicked off the day with a fantastic GOLD medal in the U15g Hammer with a PB throw of 44.21. Well done Stella! Meanwhile, Lucy narrowly missed out on a medal in the u20w 800m with a fantastic run of 2:17.83. This was followed by Jacob, stepping up an age group to run in the 2000m SC, where he ran a fantastic PB of 6:55.54! Then Euan came 6th in his u15b 80H heat with a time of 14.68, and Owen came 7th in his 200m heat with a great time of 23.80. Well done to everyone!